Every now and then, I like to take the time to check out the New York Times Bestseller List. I ignore special categories like non-fiction and just stick with what is actually good – fiction. Gone Girl has shown up quite a few times, which actually got me interested in reading it – and I did – at least the first half of the book. The book itself read a little differently than I was used to, and was especially hard to keep track of in the e-book version…because there’s not really chapters, just dates and times…it’s hard to explain. So I stopped reading, hoping the film would offer a little more clarity on the subject, and it did – it’s just such a strange film…but strange in a good way. So this is about a woman named Amy that goes missing on her fifth marriage anniversary. Stereotypically speaking, her husband, Nick, is the police’s first suspect, and the film explores the very basic question on if he did or didn’t do it. Whether ‘it’ implies kidnapping or murder. Throughout the film, the audience is thrown for a loop or two…or three…which turns the entire thing from something very basic and similar to something incredibly different altogether. This is a very interesting and successful mystery story. It has very concrete separations for story progression – or more specifically speaking – acts. The first act is the blandest, as it is very reminiscent of something we’ve already seen – like the Lacey Peterson story. The other acts I can’t even delve into or I’d spoil the entire film. Just know that there are a number of possible explanations, and if you could predict the ending, then you would be dissatisfied – and in my opinion, it’s unpredictable and smart. It treads up to that line of disbelief and ridiculousness, but never crosses it…which I can totally respect. So for the most part I was satisfied. Just so you know though, the entire film isn’t what you’d expect from basically any movie – including dark psychological mysteries like this one. It gives you enough information to work as a story all on its own, but it leaves you hanging by the end as to what that means for the future. Almost like a cliffhanger, but not exactly. More like a cliffhanger to a project everyone knows will never have a sequel and they are scoffing at us for leaving our mouths open – hungry for more. I don’t really like endings like this…I know that it was their intention, but it feels more like no one could come up with a solid ending, so they threw one together and hope people responded to it well. As for the performances, well they were top notch really, especially Rosamund Pike playing our leading lady, Amy. The escalation of the tense plot mirrored the performances by all of the actors, and it’s an on-the-edge-of-your seat type of movie – even though it doesn’t feel like that at first. Neil Patrick Harris, however, just felt like he was playing Barney from How I Met Your Mother again, just a darker and more mysterious version. He even says a version of “Daddy’s Home” – one of his signature lines in HIMYM. Now, what I also wanted to mention is the surprising messages being told about marriage problems in general and my god – the demons of television news and how we as a people absolutely cling onto it and depend on it to be true…even though things might be stretched a little to reach that quota of drama that they ultimately need for viewership. I feel disgusted as a man that we are slaves to the media in that capacity. 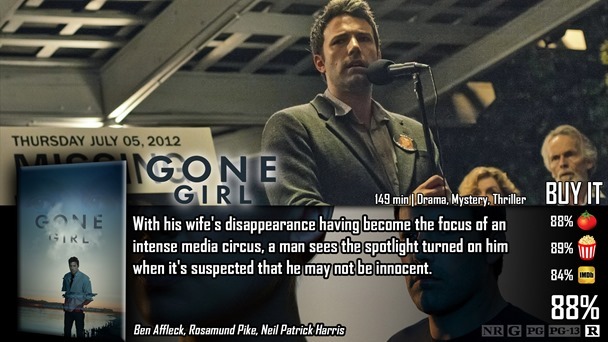 Gone Girl is a fantastic and dark thriller mystery that gets tenser as it goes along. There are fantastic and brutally honest truths being told about marriage, media, and the various different ways we as human beings react to things. We don’t live in the movies, we are infinitely different – but the media only captures us one way. The performances all around were edgy and mysterious. No one character in basically the entire film is really good…but that doesn’t mean they are necessarily a murderer either – and the way they explain what happened is kind of brilliant. It’s not technically my kind of film. I absolutely adore the way it was written and how brilliantly some of the points being made were made, but it does feel a tad too long – and the first act was a bit too slow for my tastes – even though it did peak my interest. It’s crazy, wacky, and wild, but mostly, it’s a fun piece that deserves to be seen. Good review Dave.